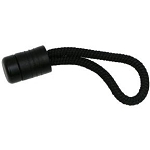 Stayput® Shock Cord Loop - Black are manufactured from high quality UV stable nylon composite components. 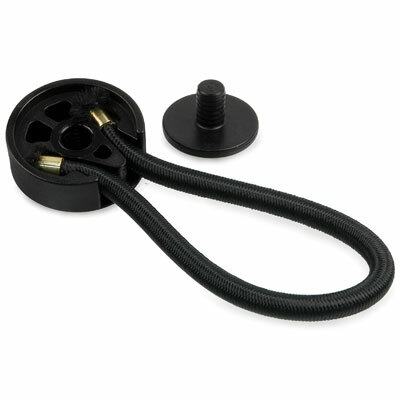 The unique design provides a superior & reliable fastening system without the need for springs or pressure to remain securely closed. 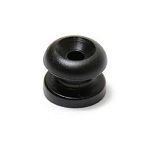 Being made entirely from nylon, Stayput Fasteners are resistant to corrosion and will provide many years of trouble free operation, particularly in a marine environment. The large back plate provides a greater contact area with the fabric reduces the risk of tearing out and damaging the fabric. Brass machine pressed crimps on the shock cord will not rust or pull off. The fitting can be removed & re-fitted with a new cord without damage to the fabric, making the Stayput Loop the best and most versatile on the market. Knob diameter: 1 1/8" - Knob height 9/16"
When Relaxed: shock cord loop end to center of knob is 3". Overall length 3 1/2" end to end. Follow this link to see how these are used. They are simple to install and can be place on the edge or anywhere on canvas.